Presentations can be imported from reveal.js, the open source HTML presentation framework that Slides uses. You'll find this feature in the Import panel which is available in the editor sidebar. 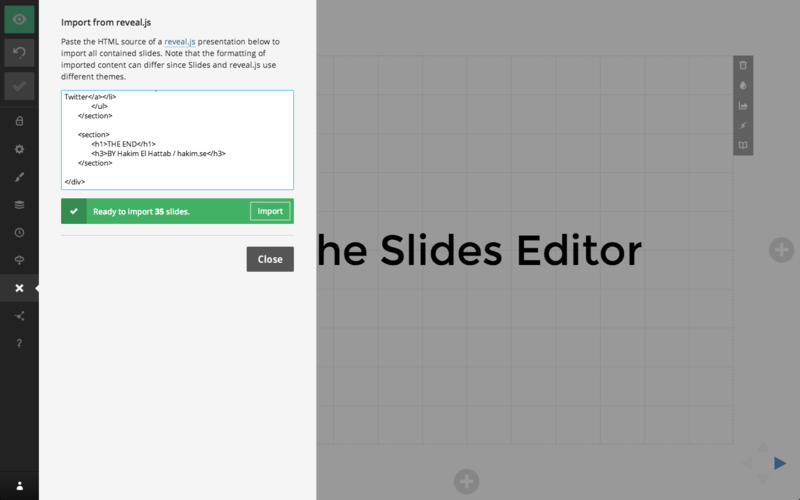 To import simply paste the HTML source of your presentation into the input field. We'll inspect the markup and let you know how many slides we were able to find. When importing content all existing slides will be replaced. If you notice something out of place as the result of an import you can always press CMD/CTRL+Z to undo it. If you're looking for an example to try this out with, you can use the source code for the reveal.js demo page https://raw.github.com/hakimel/reveal.js/master/index.html.